You've completed a fantastic printed circuit board design, but you aren't done. Now you have to select an enclosure and modify it for connectors, switches, feed-throughs, and displays. After the NRE there will be setup and tooling costs and a modification charge for each enclosure. Customizing an enclosure is an expensive, time-consuming chore, and the result is often a troublesome box that intereferes with wiring, complicates assembly, and restricts access to the board during testing and troubleshooting. Now there is an alternative! With CircuitShell, once you design the board you are done! The CircuitShell Enclosure installs easily and needs no customization. 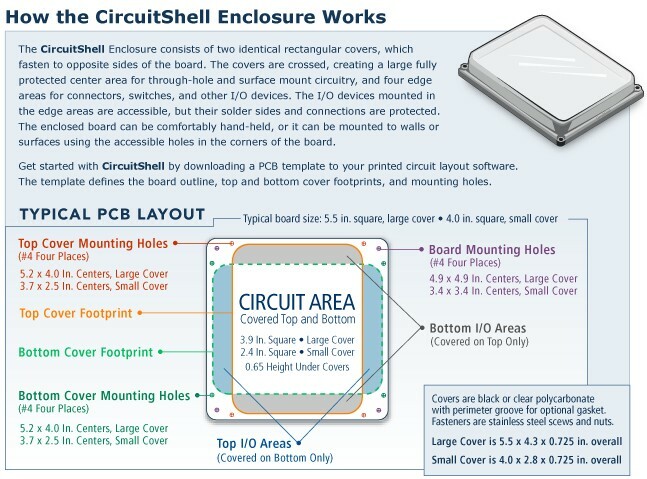 The CircuitShell Enclosure protects through-hole and surface mount circuitry but leaves switches, connectors, and other I/O devices accessible. The enclosure covers provide excellent physical protection, and a gasket is available for additional protection against dust and moisture. The covers provide ample headroom on both sides of the board for high profile parts such as batteries, displays, and daughter boards. Interchangeable opaque and transparent covers are available. The transparent cover is ideal for viewing board mounted indicators and displays. The covers never have to be milled, drilled, punched, silk-screened or otherwise customized. This saves time, cuts costs, and reduces inventory. The covers can be easily and completely removed without disturbing connections, giving full access to the board during design and testing. To demonstrate CircuitShell Enclosures we offer the GPC1 board. This is a bare printed circuit board enabling you to build the flexible and powerful GPC1 Controller. The heart of this handheld or wall-mounted controller is an 8051 core P89C66X MCU which programs directly from your PC serial port. A unique design allows hands-off remote reset and programming using just RxD and TxD. On-chip peripherals such as I2C, PCA, and up to 2 serial ports, are complemented by add-ons including a 2 × 16 or 4 × 20 LCD display with photocell/program controlled backlight, A/D and D/A converter, internal batteries and charger, battery/supercap-backed real-time clock, sound generator, control keys, and a prototype area with connector. The power management circuit conserves battery life by allowing the real-time clock alarm to turn power on for repetitive or scheduled tasks followed by power-down under program control. Operates and charges on nominal 12VDC. Uses through-hole parts for easy hand assembly. Full documentation for GPC1 is available for download, including assembly and operation guide, schematic, component locator, parts list, and test program. The GPC1 board can also be used as a prototype board for your custom circuit.